Here’s a great itinerary for a three-day weekend in Cincinnati with kids! Cincinnati USA hosted my family for a three day stay in Cincinnati, Ohio. 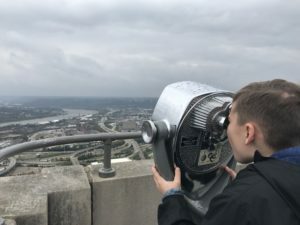 We have driven through the city many times and stopped just short of the city in Newport, KY, but have never actually explored downtown Cincinnati with kids. Why didn’t I know about everything this city has to offer? We stayed at the Downtown Westin which made walking to several area attractions and restaurants very convenient. We enjoyed views of the cityscape above and the bustling streets below. From ten floors up, we saw familiar places like a Graeter’s Ice Cream Shop (which is original to Cincinnati), beautiful Fountain Square, historical buildings turned into trendy restaurants and boutiques, giant art murals and a the street car system. This looked like a city we wanted to learn more about! Unfortunately, during our stay the rainy fall weather was not ideal for walking, but most of the attractions we visited are easy to walk to or find parking nearby. Our first day brought us to Moerlein Lager House for lunch. This working microbrewery, two-story restaurant has an upscale and casual atmosphere with spectacular views of the Ohio River and Smale Park. We enjoyed soft pretzels with beer cheese to go along with our two Moerlein craft beers and chose some lunch combos and kid’s meals. The lunch prices were reasonable and the food was delicious. The wicked sauce wings are indeed “wickedly hot” and the spicy corn chowder was perfect for the dreary day. When asked if we wanted dessert, we couldn’t pass up the opportunity to try the Black Cherry Forest Cake. After our bellies were full, we made our way across the street to the Cincinnati Reds Hall of Fame & Museum. Situated in front of the Great American Ball Park, this museum is actually quite interesting to this non-baseball watching family. The self-guided tour lead us through the history of the baseball team, multiple stadiums, famous players and other neat facts. 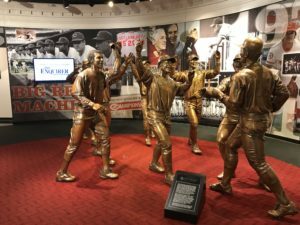 The details in the museum are great, including an area about Pete Rose, a beautiful rose garden overlook and a giant two story display of thousands of baseballs symbolizing Pete Rose’s hits. The museum includes a pitching mound complete with sensors to detect the speed and accuracy of pitches. We tried pitching like a pro and laughed at our failed attempts. There’s a small area for dressing in some of the baseball uniforms and gear and a fun room where my kids loved pretending to be an announcer for the Cincinnati Reds. Admission to the museum is $10 and under and ballpark tours are also available. Walking back down to the river, we explored Smale Riverfront Park. This newly revitalized area is wonderfully designed and sits between the Bengals and Reds stadiums. Similar to Louisville’s Waterfront Park, Smale has porch swings to take in the bustling Ohio River, but you don’t want to sit for too long at this park. There are walking trails that take you through beautiful flowers and historical monuments, a labyrinth, spraygrounds and an adventure playground next to the beautiful blue Roebling Bridge. The playground has a suspension bridge, slides, rock climbing wall and more. On the other side of the Roebling Bridge was a giant foot piano, water pumps, exercise pieces and a giant flying pig. Carol Ann’s Carousel is just across the street and offers some indoor fun for families. There are several events throughout the year at Smale Park including the Reds Opening Day Celebration in March. Dinner for the evening brought us to Americano Burger Bar which is a short walk from several downtown hotels. This burger bar has fun foosball, shuffleboard and several TVs. With a menu that included beautiful salads, unique burgers, affordable kid’s meal options and more craft beers, our family was set. Americano Burger Bar has $5 burger deals and other specials that are worth looking into during your visit to Cincinnati. Before heading to the zoo, we had to make a stop at Holtman’s Donut Shop for a sweet treat and warm coffee. Established in 1960, this donut shop is one that you don’t want to miss. It is a small shop in the Over the Rhine neighborhood with window seating, a viewing area to watch the donut magic happen and a huge assortment of donut choices. What was meant to be a small treat on the way to the zoo ended up being a half dozen donuts to-go ranging from maple glazed to Fruity Pebble topped. The shop did not slow down during our short visit. Between out of town visitors and neighbors grabbing something to go, we can see why their website suggests coming early before they sell out of donuts. We navigated our way to the Cincinnati Zoo through old neighborhoods and long hills of Cincinnati. The Cincinnati Zoo offers a unique and beautiful experience for visitors. The only item on our checklist was to see the infamous, preemie hippo Fiona, so we made our way to her. We stopped at the giraffe feedings first. For $3 each, my children were able to hand-feed a giraffe with what seemed like an extra long tongue. We quickly came to realize that the Cincinnati Zoo has several of these animal encounters, shows and interactive exhibits. Make sure you look at the schedule before your visit. We saw Fiona and her mom for a few minutes and loved telling our kids her story. 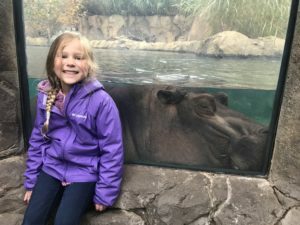 Even though Fiona is the zoo star right now, there are several wonderful animals and creatures to see at the Cincinnati Zoo. The meerkats are sweet, the red panda cubs are playful and the flamingos are boisterous! The layout of the tall trees and bamboo make you feel like you’re in a park, the animal enclosures are close up to visitors, the keepers are friendly and the popular train and children’s area with petting zoo offer many smiles and giggles. The zoo does have several food options, but we took a short ten minute drive over to the historic Camp Washington neighborhood to eat at Camp Washington Chili. This black and white checkered floor, red leather swivel counter stools parlor has been serving chili since 1940! The walls are adorned with old newspaper clippings and photos of past Food Network Channel visits. 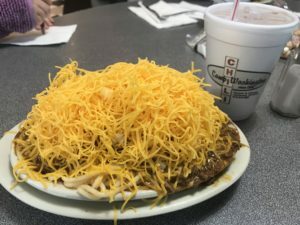 Cincinnati has several chili restaurants, but Camp Washington Chili offers a meal with nostalgia and tradition. If chili isn’t everyone’s preference, there are sandwiches and huge salads on the menu too. Children can get a hot dog or cheese coney, which we learned come from the “Porkopolis” city themselves. During our visit, we met the longtime owner, Johnny Johnson, posed for a picture and learned about his time at Camp Washington Chili. Next on the agenda was the Cincinnati Art Museum in Eden Park. The drive through Eden Park and up to the museum is beautiful (even on a cloudy, rainy fall day). Near the museum parking lot, you can see Cincinnati’s tall buildings from afar. A giant Pinocchio greets you at the pillared entranced to the museum. Admission is free and there are some great family-friendly tours available. Our docent for our Family Adventure Tour was engaging and the activity allowed us to view some great artwork in an interactive, kid-friendly manner. The museum has artwork from famous artists such as Van Gogh, Picasso and Warhol. You can also view a large collection of African, Asian and local art. The Rosenthal Education Center is an area for children to explore, create and play. Art supplies cover several large tables, projects are set up and centers surround the room. 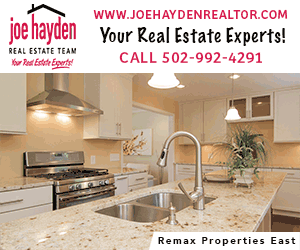 A visit to Krohn Conservatory and a walk through Eden Park would be a great addition to your day while in the area. o different elevators and two flights of stairs. Admission is $6 for ages 12 and up and $3 for ages 6-11. Visitors can enjoy spectacular 360 degree views of Cincinnati and Northern Kentucky. There are quarter viewfinders on each corner of the deck. We had a fun time pointing out landmarks, places we had visited and giant art murals we had seen from the street. Carew Tower was a unique way to experience Cincinnati from 49 floors up. Our dinner plans brought us back to the Over the Rhine neighborhood. During the short drive to Revolution Rotisserie and Bar, it’s not hard to miss the several murals painted on the sides of old buildings. There are 147 murals throughout the area and it never gets old seeing them. ArtWorks Cincinnati has private walking tours or self-guided tour maps are available. Cincinnati is not short of great places to eat and Revolution Rotisserie and Bar adds to the city’s allure. Louisville has several fried chicken choices, but Revolution specializes in rotisserie chicken in traditional and non-traditional dishes. We tried the recommended open-faced pitas and added a side dish of the parmesan garlic tots and a couple of craft beers. Kid’s meals are available and the mac-n-cheese was not from the box. We finished our dinner and walked across the street to Washington Park. This revitalized park is surrounded by gorgeous old buildings, tall trees and an Over the Rhine neighborhood bustling with restaurants, shops and entertainment. We played for a few minutes at the enclosed playground area on the swings and musical play structures. The water features and fountains are sure to be fun in the warmer months. There are restrooms, parking and a concession area at the park and events throughout the year. More sweet treats were waiting for us at the next morning’s breakfast. A Taste of Belgium has several locations in Cincinnati, but because there was a Cincinnati Bengals game the same day, we made our way to the Over the Rhine location away from the stadium. Breakfast, lunch, dinner and brunch are all served. The waffles are probably the most popular menu item, but there is so much more to choose. Menu items include a large variety like snails, crepes, burgers, salads, sandwiches, omelets, soups and of course, more beer. The waffles are not the giant ones you might find at other restaurants, but they are prepared in a unique and pleasing way. The crystalized sugar and variety of topping choices make it a perfect treat with any meal. The banana Nutella and Ricotta Cream waffles were devoured by our family. Grab a to-go bag of the waffles or a different baked good from the case for your trip home. You won’t regret it. Our last stop brought us back to Kentucky to Newport on the Levee to visit the Newport Aquarium and eat lunch at Tom & Chee. We had visited the aquarium a couple of times before, but it had not lost its charm and appeal during this visit. The jellyfish were still mesmerizing, the shark ray theater is still peaceful and the tunnels were still filled with oohs and ahhs. The interactive areas, like Shark Central and Sting Ray Hideaway, are entertaining for all ages and are a nice encounter for no extra cost. Take a walk across the Shark Bridge, stop to see the slithering snakes or try to get the rare white alligator to pay you attention. The Newport Aquarium never gets old. We ended our trip with a small, fast lunch at Tom & Chee. This Cincinnati original offers comfort food for everyone. Vegan, vegetarian, light and over the top options are all on the menu. We weren’t brave enough to try the donut grilled cheese sandwich after our sweet waffle breakfast, but did enjoy creating our own grilled cheese sandwich with some of the tomato basil soup. The low prices, variety and food make this restaurant very family-friendly. 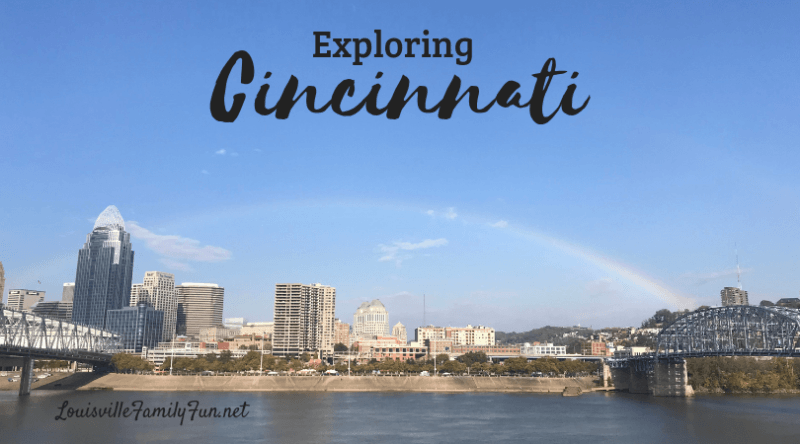 As we drove away from Newport and followed the signs to I-75 South, we looked back at Cincinnati and discussed all of the fun we had over the last three days. The city that we always looked at from across the river in Newport or from the bridge driving to Dayton is now a place we can say we explored and plan to return to explore some more. We viewed the city from 49 floors up, from a donut shop window, from a baseball player’s perspective and sitting next to the owner of a half a century old chili diner. Cincinnati is a city filled with vast history and tradition, but has connected the old to the new in a beautiful and inviting way. The art culture, multiple sports teams, award-winning restaurants, beautiful parks, and even a little hippo named Fiona will have you wanting to return to Cincinnati for more. « Christmas Tree Farms: Where to cut your own Christmas tree?